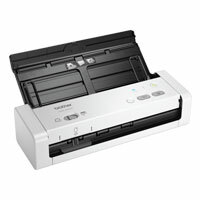 Fast scan speeds in a space-saving design - Scans single and double-sided, color and black and white documents in a single pass at up to 25ppm‡, all in a compact, lightweight design. Portable and convenient power - Compact design and powering through a Micro USB 3.0 connection to a laptop or PC makes it highly portable for mobile professionals. Handles a variety of documents automatically - Easily scan documents, receipts and photos up to 34" in length through the 20-page auto document feeder. The Brother ADS-1250w Wireless Compact Desktop Scanner with 20-page capacity auto document feeder quickly scans single and double-sided, color and black and white documents up to 25ppm in a single pass over Wi-Fi or through a local USB connection. It can be powered through a Micro USB 3.0 connection to your laptop or PC, making it highly portable for the mobile professional. The ADS-1250W supports scanning of documents, receipts and photos, and includes a dedicated card slot for plastic card scanning.Scans to multiple destinations including File‡, OCR‡, Email‡, Cloud services‡, Mobile Devices‡, and USB flash memory drive. Connect your way - Wireless scanning directly to PC and mobile devices plus USB 3.0 interface for local connections. Compatible with the way you work - Supports multiple "Scan-to" destinations: File‡, Image‡, OCR‡, Email‡, Cloud Services‡ and USB flash memory drive so you can optimize for your business process. Scan to mobile devices - Scan to compatible mobile devices using the free iPrint&Scan app. Versatile scanning - Dedicated card slot makes scanning plastic cards quick and easy. Optimizes images and text for storage/classification - Enhances scans with automatic color detection/adjustment, image rotation (PC only), bleed through prevention/background removal, text enhancement, color drop. Do more with bundled software - The included software suite provides document management and OCR software. At your side support - 1 Year Limited Warranty and free online, call, or live chat technical support for the life of your scanner.